Roger MacBride died 15 years ago, on March 4, 1995, only about eight weeks after the death, on January 7, 1995, of Murray N. Rothbard. Yet contrast their post mortem careers — Rothbard is, if anything, bigger today than he was in 1995. Roger MacBride, by comparison, seems to have been virtually forgotten. An old-timer like me has to wonder: how many libertarians under 40 really know who Roger MacBride was and why he was significant in the history of the libertarian movement? If you're of the under-40 set, feel free to email me and give me your two cents' worth on this. So who was Roger MacBride? I first heard of him in 1972, when the reporters in newspapers and on radio and TV informed me that a renegade Republican elector from Virginia in the Electoral College, one Roger MacBride, had voted for John Hospers for president and Tonie Nathan for vice president — thus casting the first electoral vote ever cast for a woman and the first electoral vote ever won by the Libertarian Party. I had never heard of Roger MacBride at this point. Nor had anyone else I knew in the libertarian movement. And my friends and I had been involved since the movement's earliest days, a few years before in 1969. Who was this newcomer, Roger MacBride? It turned out, of course, that Roger MacBride was no newcomer. I, callow youth that I was, was the newcomer. MacBride, on the other hand, was a connection back to an earlier stage in the modern libertarian movement, which had gotten underway, not in the late 1960s, as I had thought, but in the 1940s, with the publication, during World War II, of four important libertarian books — The Discovery of Freedom by Rose Wilder Lane, The God of the Machine by Isabel Paterson, The Road to Serfdom by Friedrich Hayek, and a radically individualist novel, The Fountainhead by Ayn Rand — and the establishment, the year after the war's end, of the Foundation for Economic Education, the first libertarian "think tank." 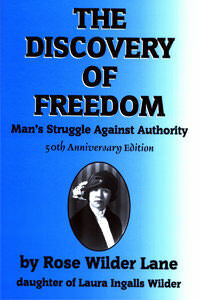 Rose Wilder Lane, the author of the first of those four libertarian books, The Discovery of Freedom, was the daughter of Almanzo Wilder and Laura Ingalls, who had moved from the Great Lakes region into the Dakota Territory in the late 1870s, determined to get for themselves some of the "free land" offered to new settlers who would homestead a claim and work it and live on it for a minimum period of time. Their daughter, Rose Wilder, was born in the Dakota Territory in 1886. She grew up there and in rural southern Missouri, on a farm her parents bought in the Ozarks after the climate of the Dakota Territory proved too much for them. The young Rose Wilder was a star student in the small-town schools she attended in Missouri and in the cajun country of southwestern Louisiana, but there was no money for her to attend college. So in the summer of 1904, just after her graduation from high school, she studied telegraphy informally at the local railroad station, under the tutelage of the station master, who was the father of a school friend. By fall, still not yet 18 years old, she was living on her own in Kansas City, working for Western Union. For the next five years, Rose operated telegraphs in Missouri, Indiana, and California. Then, at the age of 22, she met and married Gillette Lane, a young man who traveled around the country having a good time, supporting himself as he went by his gift of gab and his flair for the written word. Sometimes he took writing or editing jobs on newspapers. Sometimes he sold ads for newspapers. Sometimes he sold real estate; sometimes he wrote brochure and display ad copy for real estate developers. Whatever you needed done, if being glib would answer your needs, Gillette Lane was your man. Rose followed him around the country for several years, learning a lot in the process — acquiring, for example, some useful familiarity with newspaper offices — but about six years after their romance began, it was over. They were in San Francisco at the time — it was 1915, Rose was 28. She took a job in the newsroom at the daily San Francisco Bulletin and quickly progressed from editing other people's copy to writing her own and seeing it published under her byline, not infrequently with a photo. In those days, big city newspapers ran fiction as well as non-fiction, and Rose wrote it all — novels for serialization, short stories, profiles of famous men based on extensive interviews with those men and with those who had known them and worked with them, feature articles, you name it. Her articles and stories were often picked up for syndication to other papers around the country. By 1918, Rose had decided that her talent was larger than the San Francisco Bulletin. She would freelance, write articles and books for a national audience. And so she would, for the next 25 years. Throughout the '20s and '30s her byline would be everywhere — in the newspapers, in magazines as diverse as Harper's, the Saturday Evening Post, Good Housekeeping, McCall's, Cosmopolitan, and the Ladies' Home Journal. Her books would be in all the bookstores and sometimes on the bestseller lists. She would be, as Wikipedia puts it, "reputed to be one of the highest-paid female writers in America." But all that was in the future — the fairly near future, but still the future. For now, it was 1918. She was 31 years old, a local success with a local reputation. She believed she had it in her to do more, to make it bigger. But she wasn't sure. How could she be sure? She hadn't tried yet. Meanwhile, she had developed an interest in social and political questions. And she had decided that she was a communist. Why? Because she was dedicated to the freedom of the individual. of progressive steps to freedom. The first step was the Reformation; that won freedom of conscience. The second was the political revolution; our American Revolution against an English king was part of that. This second step won for all western peoples varying degrees of political freedom. Liberals have continued to increase that freedom by giving increasing political power to The People. In the United States, for example, Liberals gained equal suffrage, popular election of nearly all public officials, initiative, refedendum, recall, and the primaries. But now, we confront economic tryanny. Stated in its simplest terms, no man is free whose very livelihood can be denied him, at another man's will. The worker is a wageslave. The final revolution, then, must capture economic control. since the progress of science and invention enables us to produce more goods than we can consume, no one should lack any material thing. Yet we see on the one hand, great wealth in the hands of a few who, owning and controlling all means of production, own all the goods produced; on the other hand, we see multitudes always relatively poor, lacking goods they could enjoy. Who owns this great wealth? The Capitalist. What creates wealth? Labor. How does the Capitalist get it? He collects a profit on all goods produced. Does the Capitalist produce anything? No; Labor produces everything. Then, if all working men, organized in trade-unions, compelled all Capitalists to pay in wages the full value of their labor, they could buy all the goods produced? No, because the Capitalist adds his profit to the goods before he sells them. From this point of view, it is clear that the Profit System causes the injustice, the inequality, we see. We must eliminate profit; that is to say, we must eliminate the Capitalist. We will take his current profits, distribute his accumulated wealth, and ourselves administer his former affairs. The workers who produce the goods will then enjoy the goods, there will no longer be any economic inequality, and we shall have such general prosperity as the world has never known. When the Capitalist is gone, who will manage production? The State. And what is The State? The State will be the mass of the toiling workers. It was at this point that the first doubt pierced my Communist faith. Still, she persevered in her communist faith, for at least a few more years. Then, in Europe on assignment for the American Red Cross, which employed journalists in the aftermath of World War I to call public attention to its activities in war-devastated areas (thereby improving its chances of raising funds to cover the cost of those activities), she took advantage of an opportunity to visit Soviet Russia and see for herself how the noble experiment there was working out in practice. She had tea one afternoon in the home of a farm couple in Georgia. Their village, Rose wrote, some years later, during the 1930s, "was communist, of course; it had always been communist. The sole source of wealth was land, and it had never occurred to these villagers that land could be privately owned." certainly their standard of living was primitive. In a hundred years, it had not changed. They had no electric lights, no plumbing. They bathed, I supposed, only once a week, in the village bath-house, and perhaps it wasn't sanitary. How many germs were in their drinking water, no one knew. Their windows were not screened. Their dusty roads were undoubtedly fathomless mud in rainy weather. They had no automobiles, nor even horses; only ox-wagons. Their standard of living, in a word, had remained that of the pioneers of Illinois a hundred years [before]. they were the best of farmers and dairymen, they were good mechanics; they were fine housekeepers and cooks. They were open-minded and experimental. One [nearby] village had imported a Swiss, at a good salary, and built a Swiss chalet for him and his family; he was employed to raise the breed of milch cows and to make cheese in the village cheese factory. crops had been good … the cattle were fat, the granaries overflowed, and all the open house-lofts held piles of red gold pumpkins. Of course, there was not a poor man in the town. Everyone worked, and — weather permitting — everyone who worked was abundantly fed. No communist could have desired better proof of Communism's practical value than the prosperous well-being of those villagers. these people had never … had any real contact with the Czar's government. Once a year, in the fall, they had been accustomed to paying a tax-collector a tenth of the year's yield from the grain-fields. The tax-collector came riding across the plains, collected the taxes in ox-wagons, and rode away. The young men occasionally went to war … an officer rode into the village, young men rode away with him, and when some returned months or years later they brought the news of where they had been and what they had done and seen." the Bolsheviks had … been nearly four years in power and the village taxes had not been increased, nor any more young men taken for the army than during the Czar's regime. These villages depended hardly at all upon Tiflis, the nearest city, but even Tiflis was at the moment reviving under NEP, Lenin's New Economic Policy of a temporary breathing spell for capitalism. my host astounded me by the force with which he said that he did not like the new government. I could hardly believe that a lifelong communist, with the proofs of successful communism thick about us, was opposed to a communist government. He repeated that he did not like it. his complaint was government interference with village affairs. He protested against the growing bureaucracy that was taking more and more men from productive work. He predicted chaos and suffering from the centralizing of economic power in Moscow.… This, I said to myself, is the opposition of the peasant mind to new ideas, too large for him to grasp. Here is my small opportunity to spread a little light. I could understand simple Russian, but I could not speak it well, and through my interpreter I explained in primer words the parallel between the village land, as a source of wealth, and all sources of wealth. I drew for him a picture of Great Russia, to its remotest corner enjoying the equality, the peace and the justly divided prosperity of his village. He shook his head sadly. 'It is too big,' he said. 'Too big. At the top, it is too small. It will not work. In Moscow there are only men, and man is not God. A man has only a man's head, and one hundred heads together do not make one great head. No. Only God can know Russia.'" One might say, I suppose, that the Georgian farmer had hit upon F. A. Hayek's idea about the role of knowledge in society. And, by enunciating it as he did, he seems to have taken the wind, at least temporarily, out of Rose Wilder Lane's communist sails. She continued traveling around the Soviet Union after that, talking to people wherever she went. And by the time she left, she had changed her mind on a few things. "I came out of the Soviet Union no longer a communist," she wrote nearly fifteen years later, "because I believed in personal freedom. Like all Americans, I took for granted the individual liberty to which I had been born. It seemed as necessary and as inevitable as the air I breathed; it seemed the natural element in which human beings lived." And "what I saw [in the Soviet Union] was not an extension of human freedom, but the establishment of tyranny on a new, widely extended and deeper base." centralized economic control over multitudes of human beings must … be continuous and … it must be autocratic. It must be government by a swift flow of edicts issued in haste to catch up with events receding into the past before they can be reported, arranged, analyzed and considered, and it will be compelled to use compulsion. In the effort to succeed, it must become such minute and rigorous control of details of individual life as no people will accept without compulsion. producing food from the earth and the sea, making goods from assembled raw materials, and their storing, exchanging, transporting, distributing and consuming by vast multitudes of human beings, are activities so intricately inter-related and inter-dependent that efficient control of any part of them demands control of the whole. No man can so control multitudes of men without compulsion, and that compulsion must increase. It must increase because human beings are naturally diverse. It is the nature of men to do the same thing in different ways, to waste time and energy in altering the shapes of things, to experiment, invent, make mistakes, depart from the past in an infinite variety of directions. Plants and animals repeat routine, but men who are not restrained will go into the future like explorers into a new country, and exploration is always wasteful. Great numbers of explorers accomplish nothing and many are lost. Economic compulsion is, therefore, constantly threatened by human willfulness. It must constantly overcome that willfulness, crush all impulses of egotism and independence, destroy variety of human desires and behavior. Centralized economic power endeavoring to plan and to control the economic processes of a modern nation is under a necessity, either to fail, or to tend to become absolute power in every province of human life. Properly disillusioned about communism, Lane returned home and got on with her career. In addition to filling the pages of the major American newspapers and magazines week by week and month by month, in addition to publishing two novels of her own that appeared on the national bestseller lists during the '30s, she undertook another important project. Her mother, Laura Ingalls Wilder, had begun writing a series of children's books based on her own life story. She asked her daughter for help polishing her manuscripts and putting them into publishable form. Lane complied. She extensively revised, expanded, and rewrote her mother's manuscripts, producing the internationally famous "Little House" books, originally published between 1932 and 1943. The series has sold around 40 million copies in the United States in the last half century, and another 20 million or so in around 32 other languages worldwide. Unfortunately, as Lane saw it, there was no American political party committed to individualism. "In 1933," she wrote, "a group of sincere and ardent collectivists seized control of the Democratic Party, used it as a means of grasping Federal power, and enthusiastically, from motives which many of them regard as the highest idealism, began to make America over. The Democratic Party is now a political mechanism having a genuine political principle: national socialism." Another way of saying this was to say that, again in Rose's words, "[a] vote for the New Deal approves national socialism." Unfortunately, however, the Republican Party was "a political mechanism with no political principle. It does not stand for American individualism." Therefore, lamentably, "Americans (of both parties) who stand for American political principles … have no means of peaceful political action." What was needed, Rose believed, was a political movement, which would unite writers, activists, teachers, propagandists, and politicians in favor of individual liberty. A "libertarian movement" — that was her phrase. Brian Doherty reports in his book Radicals for Capitalism (an indispensable resource, by the way, for anyone interested in the history of the libertarian movement) that he found Rose using this phrase — "libertarian movement" — as early as 1947. He calls it "the first example I've found of the phrase in its modern sense." During World War II, when she was in her late 50s, Rose began working with Burt MacBride, an editor at Reader's Digest who was planning to condense one of her books for the magazine. Through Burt MacBride, Rose met his 14-year-old son Roger MacBride, and Rose and Roger quickly became devoted friends. Within a couple of years, he was calling her "Gramma" and coming to spend weekends with her, weeding her garden, running errands for her, and talking with her about history, economics, politics, and philosophy. Lane's biographer, William Holtz, writes that young "MacBride found himself receiving another education, an alternative to his classroom learning that was compelling by the range, focus, and energy his other grandmother brought to the political and economic arguments she had spent two decades in refining." Rose gave a guest lecture in Roger's government class at Philips Exeter Academy, his tony New England prep school, and lent moral support to his efforts to establish libertarian student groups at Princeton, where he earned his undergraduate degree, and at Harvard, where he went to law school. As Roger's education progressed, he continued to make himself useful to his adoptive granny — first as her agent and business manager, then as her attorney. In the end, he and his wife moved Rose and her 6,000 books into their home and took her with them when they moved that home from Vermont to Virginia. Ultimately, when Rose died — it was in 1968, she was 81 — Roger inherited everything she owned, including the fabulously valuable rights to the Little House books ostensibly written by her mother. It was Roger MacBride who put the Little House stories on network TV for most of the 1970s and the early 1980s as well. It was also Roger MacBride who put the fledgling Libertarian Party on the political map in 1972 and represented it as its presidential nominee in the 1976 campaign against Gerald Ford and Jimmy Carter. In later years, MacBride abandoned the LP and went back to the Republican Party, within which he founded a libertarian organization, the Republican Liberty Caucus. Then MacBride died suddenly of a heart attack in 1995, at the age of 65. Perhaps, MacBride's abandonment of the LP for the GOP earned him some ill will. It might have seemed like a good idea at the time, with Bill Clinton in the White House and the Republicans putting a lot of emphasis on their supposed points of agreement with libertarians, but the eight years of GOP rule from 2001 to 2009 showed just how much real interest the Republican Party has in individual liberty and limited government. In retrospect, MacBride probably looks like something of a fool to many libertarians. But then again, maybe not. In any case, Roger MacBride should be remembered and paid a debt of gratitude by all libertarians who want the movement to grow and attract public attention. For, at a time when he was in a position to do a lot for the public image of the libertarian movement, Roger MacBride came forward and did it. All quotations from Rose Wilder Lane in this essay are taken from her article "Credo," first published in the Saturday Evening Post in December of 1936 and later expanded and published as a small book by the Caxton Printers of Caldwell, Idaho.